Catalytic processes are used to manufacture 80% of all products of the chemical industry. Catalysis is also crucial in treatment of exhaust gases and energy conversion. It is vital for these processes to function as rapidly and efficiently as possible; that saves time and conserves resources while also protecting the environment. Industry is constantly analyzing new substances and arrangements that could result in new and improved catalytic processes. Recently researchers of the Paul Scherrer Institute (PSI) in Villigen and ETH Zurich have formulated a technique for enhancing the precision of such experiments, which could accelerate the hunt for optimal solutions. 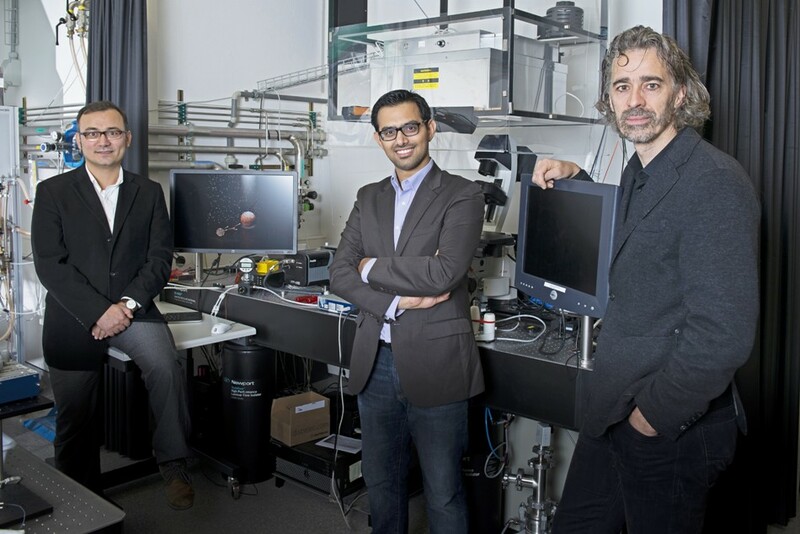 Simultaneously their technique has enabled them to resolve a scientific debate that has lasted for more than 50 years. They explain their process in the Nature journal. With a new process, Swiss researchers are making it easier for the chemical industry to examine and improve catalytic processes. According to Waiz Karim, who is affiliated with both the Laboratory for Micro and Nanotechnology at the PSI and the Institute for Chemical and Bioengineering at ETH Zurich, they have discovered a method to build catalytic model systems - that is, experimental set-ups - accurate to one nanometer and then to monitor the chemical reactions of individual nanoparticles. This makes it possible to selectively improve the efficiency of catalytic processes. Catalysis is a fundamental process in chemistry: Reactions of substances are stimulated or accelerated through the presence of a catalyst. It has a main role in the manufacture of acids, synthetic materials, and other chemical products, in energy storage, and in the treatment of exhaust gases. For this reason, the industry is very keen to improve catalytic processes. "To do that, you need a deeper understanding of what is going on at the molecular level", says Jeroen van Bokhoven, head of the Laboratory for Catalysis and Sustainable Chemistry at the PSI and professor of Heterogeneous Catalysis at ETH Zurich, who led the study. This in-depth understanding can be obtained through the new process: The researchers constructed a model system that enables them to analyze catalysis in the most microscopic detail. The experiments were performed mainly at the PSI, and the theoretical basis was conducted at ETH Zurich. For the model experiment, the team of Karim and van Bokhoven made use of iron oxide, which was converted to iron by adding hydrogen and with support from the catalyst platinum. The platinum splits the molecular hydrogen (H2) into elemental hydrogen (H), which has the capacity to more easily react with iron oxide. The main attraction of their model: With advanced electron-beam lithography, which is used primarily in semiconductor technology, the researchers were able to place tiny particles, comprising of just a few atoms each, on a support. Iron oxide particles measured just 60 nm in size while the platinum particles measured even smaller at 30 nm - approximately two-thousandths of the diameter of a human hair. On a grid-like model, the researchers arranged these particles in pairs at 15 different distances from each other. In the first grid segment, the platinum particle lay accurately on top of the iron oxide particle, and in the 15th segment, the particles were placed 45 nm apart. The iron oxide was totally alone in a 16th segment. Thus we were able to text 16 different situations at once and control the size and spacing of the particles with one-nanometre accuracy. Then they vaporized the model with hydrogen and observed the occurrence. For this observation in the molecular domain the team had, in a previous project, used a technique known as "single-particle spectromicroscopy" to test miniature particles using X-rays. The instruments required to perform this can be found at the Swiss Light Source SLS of the PSI, a large-scale research facility that produces superior-quality X-ray light. "In previous studies, placement of the nanoparticles of two different materials could be off by up to 30 nanometres," said Karim. What was observed was that certain chemical phenomena occur on an even smaller scale. One of these is referred to as the hydrogen spillover effect, which the PSI and ETH researchers studied using their new model. This effect contributes to the efficiency of catalysis with hydrogen. Although discovered in 1964, until recently it was not understood or visualized in detail. Consequently, the circumstances under which it happens remained controversial. The team of Karim and van Bokhoven were able to test it for the first time with the required precision: The hydrogen molecules split the moment they come across the platinum particle, and then the elemental hydrogen flows down the sides on top of the support material. Then just like how water streams out of a spring, they spread out all around. The researchers state that when the hydrogen atoms came across the iron oxide particles, it reduced them to iron. "We were able to prove that how far the hydrogen flows depends on the support material", Karim reports. The farther it flows, the more the spillover can contribute to the catalysis. If the support consists of aluminium oxide, for example, which itself cannot be reduced, the hydrogen flows no farther than 15 nanometres. With reducible titanium oxide, in contrast, it flows over the whole surface. Clearly, for some support materials it is important how tightly the particles sit on them. Therefore, with their new nanotechnology process, the PSI and ETH researchers have clarified the circumstances of the hydrogen spillover effect. "Our method rests on three pillars", says Jeroen van Bokhoven, "the nanofabrication of the model system, the precise measurement of the chemical reactions, and last but not least the theoretical modelling: In accordance with the experiments we were able to describe the process down to the molecular level." With this we are opening up a whole new dimension for the investigation and understanding of catalytic processes. And with this understanding, industrial production processes can be optimised in a much more targeted way.